Deep in an ancient forest, a trembling young woman enters the clearing where a ramshackle hut crouches on birds legs. Far below the earth, a caravan of kobold merchants passes through a stone archway carved with the faces of leering ghouls. High atop a northern mountain, a dwarf grips his battle-axe and gazes over the rim of the world toward whatever fate the gods have in store for him. This is Midgard, and its gates are now open. Eastern Europe plus a heady dose of weird fantasy. 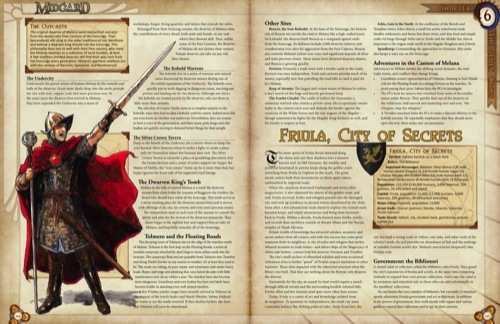 Lead designers Wolfgang Baur, Jeff Grubb and Brandon Hodge led the Open Design community in a two-year project to build a sprawling setting supported by adventures and sourcebooks compatible with the Pathfinder Roleplaying Game, Dungeons & Dragons, AGE System, and more. Midgard is ley line magic and warped alchemical experiments; the Western Wastes giant, shambling horrors and magic-blasted landscapes; diabolical gnomes and the schemes of immortal Baba Yaga; wild, wind-riding elves and swashbuckling minotaur corsairs; the Mharoti Empires lethal assassins and exotic splendors; and the dragon-haunted crags of the icy Northlands. Your hardcover ships in a securely packed and padded envelope to avoid any damage to your book. With playtest, review, brainstorming, and commentary by the project patrons, this is a world that has been through the fires of creation to make a stronger steel. Midgard Bestiary  Monsters your players have never seen! The Lost City  A desert ruin hides ancient dangers, and impossible treasures. 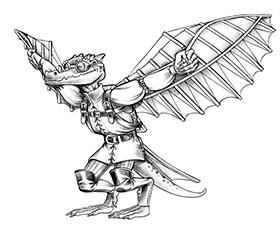 Midgard Bestiary for AGE  50 monsters your AGE players have never seen! 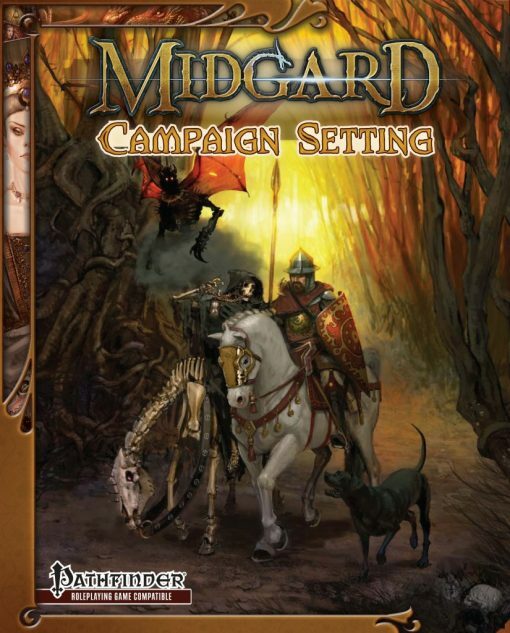 The foreword explains the origins of Midgard as Wolfgang Baur’s own home game setting that he’s been building since he was 14, and how it is amazing even to him to see the piles of scribbled notes and sketched maps that he ran games from turned into a full-colour proper book! Like many gamers I’ve long enjoyed creating my own worlds to adventure in, but few of us have the talent, perseverence and opportunity to share them with anyone other than their gaming group. 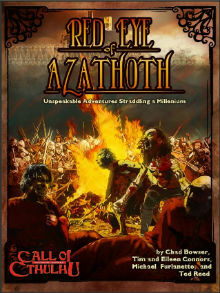 This one is replete with a depth that comes of some 25 years of dreaming, writing and playing, jam-packed with lots going on never mind what adventurers might be doing yet plenty of opportunities for them to get involved or carve their own path. 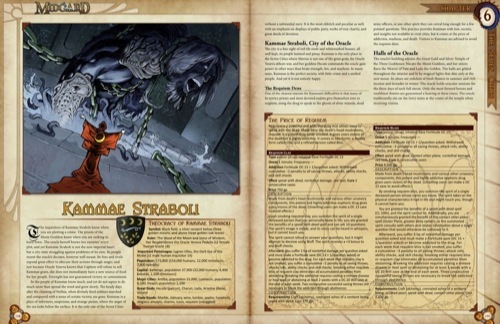 Just what you want in a campaign setting! Chapter 1: Welcome to Midgard gives a high-level overview of the world. It’s a place with a rich history of heroes that has fallen on dark times, a place waiting for new heroes to arise. For anyone who might think that this sounds like many other campaign worlds, seven differences between Midgard and ‘standard’ fantasy settings are laid out. For a start it is flat. In a quasi-mediaeval world, you might expect plenty of people to think that their world is flat, but this one really is flat. With edges. There are ley lines, utilised by the elves. Dragons are linked to the elements, and enjoy ruling whatever they can get their claws on, as well as the traditional dragon pursuit of amassing a good hoard. There are novel races, each with their own history and place in the world, as well as the standard fantasy human, elf, dwarf and so on. Personal prestige is important. The deities meddle with what goes on in mortal life. And it’s not a static place. Boundaries between kingdoms change. Dynasties rise and fall. The party may have a chance to influence – even instigate – such change, but happen it will whatever they do. The epic sweep of Midgard’s creation (or at least, what is known and surmised about it) is then explained. Naturally all deities claim to have made it, but it’s likely that they are lying. The creation myth told by the Northlanders is probably closer to the truth, but who knows? Races came and went, kingdoms rose and fell, a succession through giants and then elves until now when, although the other races are still around, humans take a more prominent role. Naturally the succession has rarely be peaceful with rebellions and wars… and if battlefield strife was not bad enough, the wizards cut loose too and waged war with arcane powers, leading to great swathes of devastation. And then the dragons and the vampires emerged to stake their claims… Ending with events of the last hundred years, the chapter finishes with a discussion of time, planets and dates. Flat or not, Midgard has a sun that rises in the east and sets in the west, not that anyone knows just what happens to it when it is not in view. There are moons and planets around as well. Naturally there are quite a few festivals and holidays to celebrate. Next is Chapter 2: Heroes of Midgard. This provides details about the major races and assorted minor ones to be found in Midgard. It includes fascinating snippets and a wide range of variation within races, depending on where they hail from – things that create a diverse society and plenty of options for those seeking to create characters truly embedded in the lands from which they come. 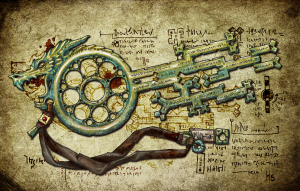 Humans, dragonkin, dwarves, elves, the gearforged, kobolds, and minotaurs make up the major races, and whilst some are well known, those that are not are described in sufficient detail to empower players who wish to experiment with a novel race for their character. There are seven minor races as well, ones who – as well as being less familiar as player-character races – are only found in specific parts of the world. There’s a note on languages, and then it’s on to a collection of Midgard-specific feats and traits. No matter where your character comes from, there is a range of traits that he can choose between, all providing distinctive regional and racial flavour. And so it continues through chapter after chapter until all seven regions are described. As you read, the roots of Midgard begin to show: Middle European folk tales and legends, often the darker nightmare-inspiring end of things. But there is much more. A cluster of halflings around the great World Tree of Domovogrod, nomads roaming vast plains with a ‘city on wheels’ that travels around, as nomadic as the people it serves. There are spreading forests and towering mountains, strange customs and stranger titles… never mind the beings bearing them. Every region has distinctive spells, equipment and more. Throughout, there are suggestions for adventure, rooted in the people and places you are reading about at the time. The richness of this setting is matched by how integrated it is: sometimes you read of a campaign world where it seems a human world with other races tacked on because a fantasy world ought to have them: here they belong, as integral a part of the setting as any other creature. After the regional chapters, there is a chapter detailing the pantheon of Midgard. It takes things much further than the usual list of deities and the domains over which they have influence, though. These gods are properly mysterious, they and their ways cannot be understood and categorised by mere mortals. Sometimes aloof, they can be jealous – it’s said that the best way to attract one god’s attention is to worship another one! – and are said to interfere in mortal affairs. Through a system of ‘masks’ deities are able to walk the land and meddle in whatever takes their interest. Mechanically, there are new domains and spells and the concept of the pantheistic priest. This novel cleric worships the five gods designated as the major powers wherever he lives, each week chosing one of them to venerate and receiving access to the appropriate domains. The underlying reasons for why the gods of Midgard are as they appear are explained, but this is a matter properly for the GM: even their clerics and most fervent devotees do not know! There’s a lot of material here, enough to keep the keenest student of theology busy. 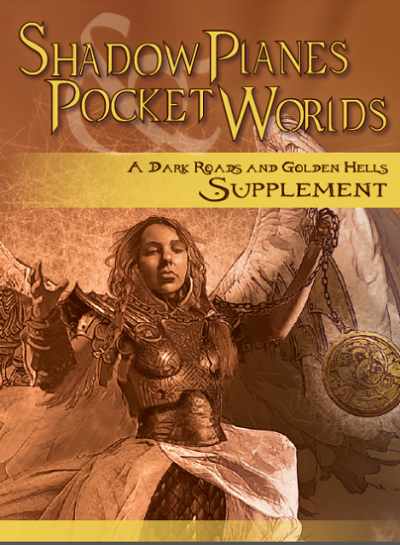 Finally, an Appendix provides resources for those who’d like to use the Midgard setting with the AGE system rather than Pathfinder. It’s the sort of world that you feel that you could take a lifetime exploring it and still feel that you have only scratched at the surface. This is a book to dip into, to browse through, to read again and again. Whether you like to prowl in the woods, roam vast plains, travese deserts or trudge through deep snow, there is adventure and excitement and things to see and do at every turn. Primarily a book for GMs, there’s a series of Player’s Guides to the different regions available, if you want your players to learn more about where their characters are without giving away too many secrets. In sheer depth and richness, this setting is hard to beat – and one wonders just how so much is packed into ‘only’ just under 300 pages!